Following on from the brutal death of the British Labour MP, Jo Cox, at a constituency meeting in West Yorkshire the UK and international press has rushed to examine the killer’s background and alleged political views. So far it has been fairly tenuous stuff, largely based on eye-witness claims and links to the Far Right movement in Britain dating back to the early 2000s. Given Cox’s prominent role with the pro-EU “Remain” campaign in the upcoming in/out referendum on the United Kingdom’s membership of the European Union, the killing has left the anti-EU “Leave” camp very much on the back-foot. While the cross-party “Remain” lobby would be loathe to admit it, there seems little doubt that the MP’s murder will swing the debate back their way after weeks of poor polling. The shock and disgust at the death of a popular left-wing politician and young mother will surely persuade many in the significant “undecided” category to support the present status quo. Whether that will be enough to negate the narrow lead held by “Leave” will become evident on the 23rd of June. “The man arrested over the killing of Labour MP Jo Cox is believed to have had long-term links with a hard-right group based in London which had been campaigning for many years for Britain to leave the European Union. Thomas Mair was named as a supporter in an online publication of the Springbok Club, an organisation which has defended the white supremacist apartheid regime in South Africa. The leading article for June 2016 Springbok Cyber Newsletter, which describes itself on its website as being pro-free market capitalism and patriotism and anti-political correctness, was, however, devoted to Britain and the referendum. The name of the group sparked my interest because I was sure that I had seen it mentioned in relation to support for militant unionism in the north-east of Ireland, especially among the Far Right and Neo-Nazi movement in Britain. In particular I was reminded of several individuals from the UK who were linked to the gunmen and bombers of the Ulster Defence Association – Ulster Freedom Fighters (UDA-UFF) and the Loyalist Volunteer Force (LVF). Sure enough, a quick search revealed that the Springbok Club was linked not just to the violent fringe of unionism but to the very core of its political leadership. In August of 2004 the republican newspaper, An Phoblacht, reported on a speech at a meeting of the “Northern Ireland Springbok Club” by the Reverend Martin Smyth, a member of the Ulster Unionist Party (UUP) and MP for South Belfast. As well as being an associate of the sectarian Orange Order the Rev. Smyth was also the one-time deputy leader of the Conservative Monday Club, a far right lobby group in Britain. By 2001 the organisation had become so embroiled in accusations of racism that its mother-party, the Tories, suspended their formal ties with it. 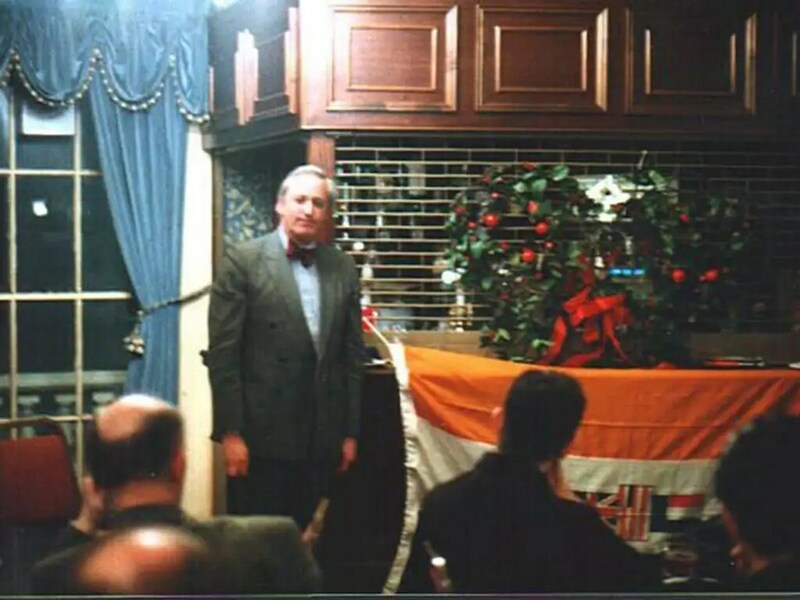 “REVEREND MARTIN SMYTH, Orange Order big-wig and Ulster Unionist MP for South Belfast, was the star turn at a recent dinner in London for white supremacist supporters of Apartheid South Africa and racist Rhodesia. The old owl of the UUP claims that his audience included people of all races when he addressed the ‘Northern Ireland Springbok Club’ in June, which would be curious seeing as the Springbok Club came out of a merger between the White Rhino Club and the Rhodesian Forum and holds its meetings under the old Apartheid flag of pre-democracy South Africa and calls for a return to whites-only rule. The Springbok Club (also known as the Empire Loyalist Club) was formed in 1996 by Alan Harvey and Bill Binding, prominent Far Right activists in Britain, as an avowedly racist body. It was relaunched in 2001 with a slightly more respectable face, the explicit hate-speech repackaged in quasi-academic language, attracting the attention of several unionist politicians (conservative historian Andrew Roberts was one of those sucked in by the grouping’s new-found civility). Since then it has beavered away in the background of UK politics, a sort of Klu Klux Klan for men in suits. One of it’s leaders in the Six Counties, Jim Daly, stood as an independent unionist candidate for the British parliament in the constituency of Fermanagh and South Tyrone in 2001, with the support of the Democratic Unionist Party (DUP). Previously he had worked with the defunct UK Unionist Party of Robert McCartney MP. He was also closely associated with the “Love Ulster” demonstration in Dublin, and the subsequent riots, in February of 2006. Of course the more serious links between violent unionism in the north-east of Ireland and “White” South Africa stretch back to the 1980s when elements of the UK state, primarily within the Intelligence Corps (Int. Corps) and the Security Service (MI5), sought to rearm various pro-British terrorist factions in the disputed region. The successful importation of hundreds of weapons via the Lebanon brought the proxy forces of Britain’s counter-insurgency struggle with the Irish Republican Army, and the communities which supported it, to a new level of lethality, leaving dozens of men, women and children dead or injured. This was seen most graphically in the Loughinisland Massacre of June 18th, 1994. “It is a photo that its subject might prefer to forget. Neil Hamilton, the Ukip deputy chairman and would-be election candidate, stands by a flag that ripples with racist symbolism. Revealed here for the first time, the image shows the disgraced former Tory MP speaking, as guest of honour, to an expatriate club that calls for a return of “civilised rule” to South Africa. Taken just four years after Nelson Mandela’s election ended decades of brutal apartheid, the photo of the meeting of the Springbok Club – which flies the apartheid-era flag – emerges at a time when Mr Hamilton’s past threatens to divide Ukip and thwart his attempts to return to parliament 17 years after the “cash-for-questions” scandal forced him out. A report of the 1998 meeting written by the club’s founder has been deleted from its website, but survives in a digital archive seen by The Independent. Mr Hamilton admitted delivering a speech at the club’s annual “day of the vow” meeting, but said he had no memory of what he said, or of Mr Harvey. “The quotation is his not mine,” he told The Independent. And here is a note lamenting the passing of the notorious British terrorist, Robin “the Jackal” Jackson. In such grubby corners does British unionism in Ireland find its allies. UPDATE: Thanks to “From London” for more posts from the “Springbok Cyber Newsletter“. Times : Assemble from 17.30 hrs onwards, main activities to start at approx. 19.15 hrs. Venue : The CLARENCE (the upstairs Function Room), 4 Dover Street, Mayfair, London W1 (just off Piccadilly – nearest underground station: Green Park). “It was with disbelief that we say the name of a certain John Hiddleston appearing as an official candidate for the Ulster Unionist Party in the Belfast South constituency during the recent Northern Ireland Assembly elections. Long-standing subscribers to “S.A.Patriot” will undoubtedly remember Hiddleston’s notorious name well. When the magazine was founded by the original “White Rhino Club” in 1980 none of the WRC ExCo members were in a position to take on the editorship officially, either because of their employment positions or because they were slating for South African citizenship. Two de facto editors were appointed however, an Afrikaans gentleman and a British emigrant who had been in South Africa for four years. Hiddleston had only arrived in the country a few weeks earlier, and was known to the British emigrant through their earlier mutual membership of the [British] National Front. At the time the NF had two distinct factions, a democratic wing that the British emigrant belonged to, and a neo-fascist wing that it transpired Hiddleston was associated with. As Hiddleston had previously been editor of the NF’s Northern Ireland magazine “The British Ulsterman” he was therefore approached to become the nominal editor of “S.A.Patriot”, a position which he readily accepted. Would-be power soon went to Hiddleston’s head however. He unilaterally opened up a separate bank account for the magazine, with himself as sole signatory, independent of the WRC, which caused many misgivings. He also started to try to influence editorial decisions, becoming an “instant expert” in South African affairs after only being in the country for a few short months! Matters came to a head, however, when he bretrayed his neo-fascist sympathies by advocating that anti-Semitic items should be included in the magazine, an idea which was of course vetoed by the others on the editorial board. Shortly after this Hiddleston mysteriously disappeared down to Cape Town – and immediately withdrew all of the magazine’s funds from the bank account for his own personal use! To make matters worse he even issued a “bouncing” cheque to the magazine’s printers! “S.A.Patriot” of course managed to survive this disaster, but Hiddleston sinister reappearence in Durban a couple of years later, and attempted (unsuccessfully) to cause yet more troubles for the magazine. It might be supposed that Hiddleston could have matured and moderated his views over the years, but we have recently learnt that he now edits a broadsheet called the “The Ulster Watchman” which has clear anti-Semitic undertones, albeit in the guise of anti-Israelism. References to elected politicians or members of the DUP and UUP, not to mention various pro-UK terrorist factions in the north of Ireland, fill the posts of the “Springbok Cyber Newsletter”. Extraordinary what one can find when one peers into the darker corners of British nationalism. I’ve added an obituary from the Springbok newsletter praising the loyalist killer, Robin “the Jackal” Jackson, to the post. Added the link, Daniel. More digging will undoubtedly yield more stuff. Another establishment-linked rock in Britain under which the grubs crawl. The Conservative Monday Club, the London Swinton Circle, etc. are all of a type. Well, it was fairly civilised in comparison with what has come after it…. Eolas an-shuimiúil! Maith an fear, a Shéamais! Truly superb research there Séamus – exposing the deep links of Ulster Unionism with some of the most racist and reactionary ideologies in recent history. 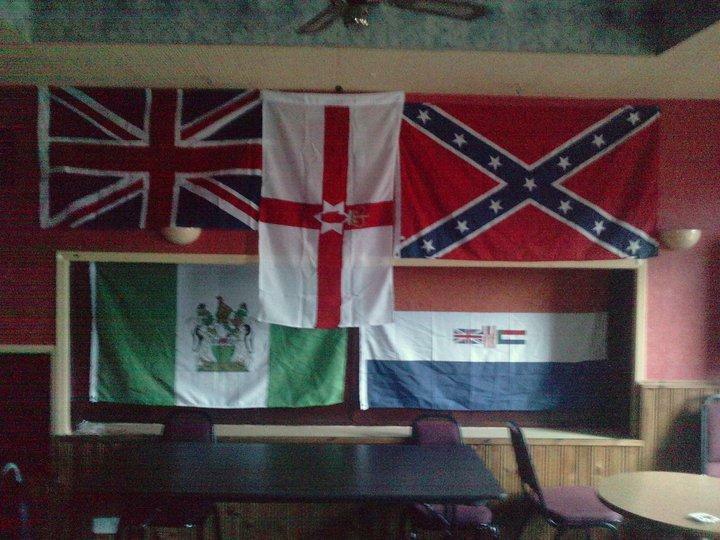 In addition, the photo of the Flags – Apartheid South Rhodesia, US Confederate, Apartheid South Africa and the Ulster Banner – is in itself with a thousand words. Just as those odious racist states were overthrown by the relentless march of history, so too the artificial statelet in the North of our country is doomed. Can only add… very good work indeed. What interests Me here is that these elements not only survive, in 2016, but are actually tolerated by the UK state and Government, patronised by some politicians connected to that Government, and remain, as always, a dangerous set of semi-paramilitary groups that at any time in the future, can again be unleashed. All this is NOT of historical relevance only. The BREXIT campaign and vote has stirred up some dangerous currents. If it is a yes vote, then a hard border with the South is inevitable for the North, and these groups will come crawling out into the daylight and stir things up. Violence is then highly likely. The population in the North will polarise again to it’s original default positions, and the Peace process and settlement will be at risk. Given the links with “Mainland” far-right groups, pro-BREXIT violence is also possible there. So the more we know about their ongoing activities, the better. keep up the good work!!. Added those links into the post. Thanks! Hiddlestone has a long inglorious with the extreme right and was one of a number of moles Combat 88 placed in army TA units, his case QUB’s OTC. Unfortunately, his proselytising was too much there, he was nicknamed Heinrich and often given a Nazi salute and Heil Heinrich as he passed his fellows. Not surprisingly he didn’t last at this or indeed anything else he has ever done in life. I worked with a very nice UDR officer in the 1980s. He had been approached by Apartheid agents trying to get him to join their army. He refused to have anything to do with it.